Baselworld 2016: Presenting the new Girard-Perregaux Sports Competizione 'Circuito' Chronograph. Hands-on Review, Live Pictures & Pricing. To celebrate the 225th anniversary of the manufacture founded in 1791, Girard-Perregaux presented at Baselworld 2016 a brand new collection of racing inspired timepieces named 'Sports Competizione' —the word for competition in Italian. As you all know, Girard-Perregaux has a rich history making racing inspired timepieces like those from their partnership with Ferrari or with pieces like the GP Monte Carlo 1970. The new Girard-Perregaux sports competizione collection is composed of two new 12-hour chronographs: the 'Stradale' —which we reviewed here— and the 'Circuito' —track circuit in Italian— which we now bring you here. This new Girard-Perregaux Circuito is not only light as a feather but equipped with a very interesting case material. The new GP Circuito chronograph comes with the same case size measuring 42 mm in diameter and case design with the caseband featuring long, subtly rounded lugs like the new Girard-Perregaux Stradale. However, what sets this watch apart from its sibling, is the case construction in a composite that combines titanium and carbon, giving the watch a metallic polymer look reminiscent of very high end sports cars. The use of this alloy meant that the case design had to be specifically developed to accommodate the composite material. The new Girard-Perregaux Sports Competizione 'Cicuito' chronograph also features the same type of pump-pushers with mushroom tops of its sibling the 'Stradale'. The case on this new watch is so light —weighing only 56.6 grams—, that only a few minutes after putting it on, you almost forget is there on your wrist. The weight we are providing, includes the strap and buckle, therefore, our guess is that the watch alone is less than 30 grams. The sheen on the case material is very unique and quite different to that found on forged carbon watches. This composite is four times lighter than titanium and eight times lighter than steel. The pushers and crown are made of DLC coated titanium. To make the new Baselworld 2016 Girard-Perregaux Sports Competizione 'Circuito' Chronograph even more interesting, the manufacture decided to fit the watch with a black 'honeycomb' open-worked composite dial with perforations resembling the radiator grilles and air inlets of sports cars. Definitely the right inspiration for a piece like this one. The dial features slightly sunken/recessed black rings for the registers in the running seconds at 3 o'clock, the 12-hour chrono register at 6 and the 30-minute register at 9 o'clock. A relatively small date aperture is found at 4 o'clock and both the long central sweeping chronograph seconds hand and the running seconds hand are perfectly accentuated in a bright burnt orange/crimson red. a carbon-effect calfskin strap with a double folding clasp in DLC coated microbead-blasted steel. On the wrist, the watch wears true to its size on a 7.25" wrist. Some of the words that come to mind when wearing this gorgeous sporty chronograph are manly, robust, lightweight and ultra sporty. 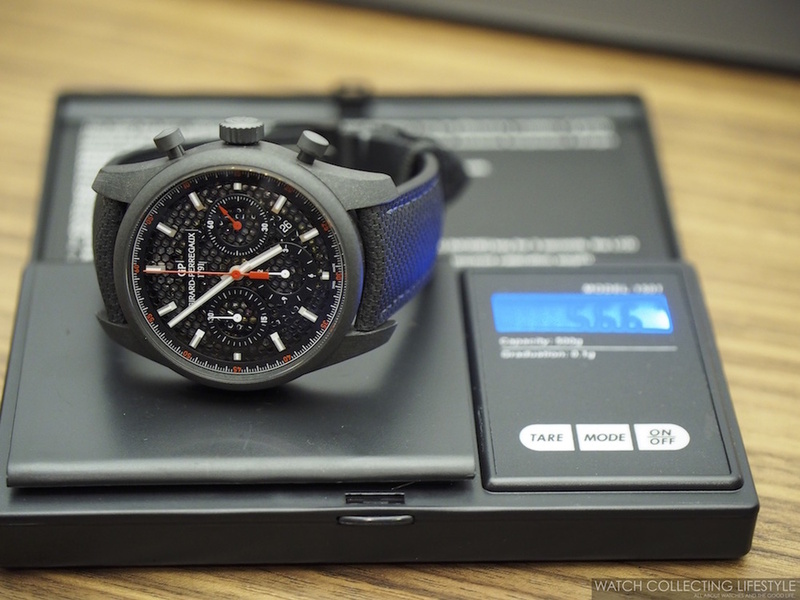 This is a watch that we are confident will be a huge success and one that we are sure we will see paired very quite often with cars like a Lamborghini Superleggera or a Ferrari 458. Sticker Price CHF 12,600 Swiss Francs. For more info on Girard-Perregaux click here. Posted on March 22, 2016 by Editor & Publisher and filed under Baselworld, Baselworld 2016, Girard-Perregaux and tagged Girard-Perregaux Baselworld Baselworld 2016 Most Popular.